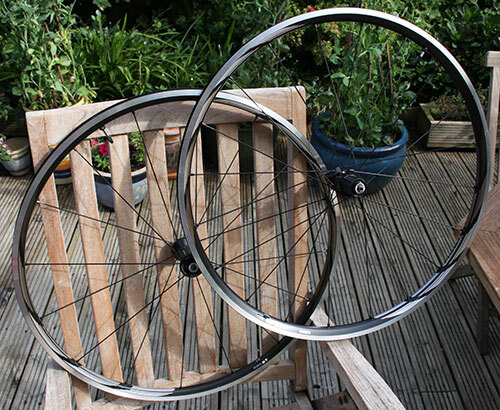 With the RS10’s on my Kinesis cyclocross bike starting to feel their age and the RS30’s still pressed into regular service on my son’s bike, I needed to find some new cyclocross wheels. I couldn’t find any reason for limiting my search top cyclocross-specific wheels, especially as the Kinesis is not used for huge mileages – it gets the weekly race and maybe a spin round the trails if I fancy some cx-type training. So that opened up all sorts of possibilities for wheels, as long as they were compatible with cyclocross tyres, and I’ve already to stick with Vittoria tyres for the time being, so that helps that part of the wheel-search equation. o – Campagnolo Scirocco and Vento – £166 and £145 respectively, the latter reduced from £195 and both around !675g in weight. o – Shimano RS61 – £150, reduced from £270. Weight about 1800g, but can be run tubeless. 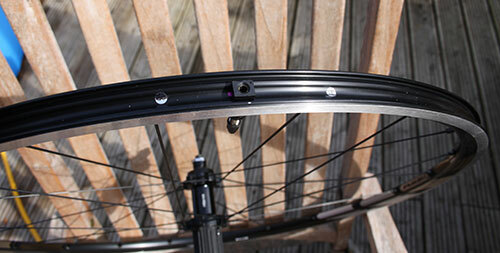 o – Fulcrum Racing 5 – £150 from £240, and @1600g. o – Mavic Aksium Elite – £140 from £219. All good wheels and great in their own right, and I was keen to go down the Campag route as the wheels look so good, and I know that Mavic have a bombproof reputation. 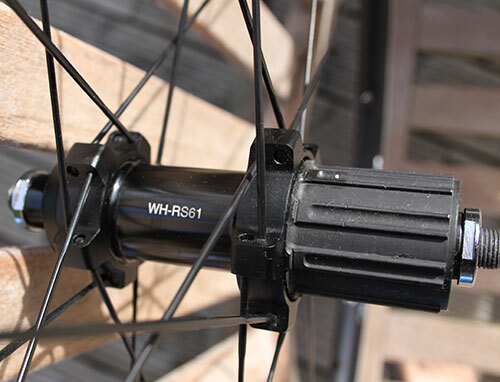 But, despite my usual reservations about the brand, the Shimano RS61’s swung it by being tubeless ready out of the box. First impressions, as you’d expect from any factory-built wheelset, are very positive – they’re well-built, the spokes are tight, etc, ettc… so no reason why they shouldn’t ride happily from the off. o – Shimano RS10 – Front 793g, Rear 1057g. o – Shimano RS61 – Front 773g, Rear 1089g. o – Shimano RS30 – Rear 1140g. So the brand new and very shiny RS61s are 12g heavier than the old RS10s!! However, the Lifeline (700×28/35c) inner tube that I’ve just taken out of the Vittoria tyres weighs in at 115g, so that 230g saved off of the rims over the two wheels, surely that going to make a difference? The tubeless set-up wasn’t very easy and I had to resort to using CO2 canisters to ‘blow’ the Vittoria tyres onto the rims, but they’re together now and ready for a spin later this evening. Update 30th June 2015 – I got a 21km ride in last night on the new wheels to make sure that there were no teething problems ahead of the next round of the Western Cyclocross League tomorrow night. Everything ran as hoped and after nearly an hour on local trails the RS61s were still running true. Although there’s not a huge difference in the weight between these and the old RS10s, first impressions are that losing the inner tube helps these new wheels to ‘spin up’ more quickly and then hold any speed more steadily. It should be said that this wasn’t the most scientific of tests and there’s a big caveat – my last three cyclocross races on the old RS10s were mainly on grass and last night’s spin around the Fosse Way was predominantly hardpack trail, so you’d expect the riding to be quicker. Which means that, although the decision to go tubeless appears to be sound, the real proof of the pudding will be in tomorrow’s race at Warmley… I’ll get back after that. Update 10th July 2015 – I raced Round 8 of the Western Cyclocross League on the RS61s and they’re clearly a huge step up from the RS10s. As expected they spin up quicker under load and they hold the speed noticeably better – what this means is that they’re easier on the legs, so they did increase my speed. To be fair the course was a fast one, but the wheels came out unscathed despite the higher speeds, stony paths and quicker corners (on loose unstable gravel). My only concern is that, during the practice laps, especially on lumps in the corners, the rear tyre lost some air – I started at a fairly low pressure, about 40psi, and had to increase it to over 50psi to keep the tyre more firmly seated on the rim. This could be down to the combination of the rim and the tyre (Vittoria XM) – I’ll try some more tests to see how this fairs with different set-ups. Previous PostShimano RS30 for cyclocross?